The Magnetic resonance imaging (MRI) is a high resolution imaging process without radiation from x-rays. It is based on the application of strong magnetic fields and has no known undesirable effects today. In contrast to an x-ray, not only bones but also soft tissue can be depicted on MRI, e.g. muscle, joint capsule, articular discs, tendons, and ligaments. 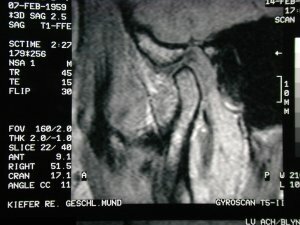 Therefore, when the MRI was introduced about 20 years ago, orthopedists had great hope to be able to find out which exact structures in the back cause pain. Furthermore, there was great hope to use the findings of MRI targeting to treat diseased structures. Unfortunately, these wishes have been largely disappointed because many patients with structural damage are painless, as well as patients with no structural damage do have severe pain. Therefore, damage to tissues and the pain caused are largely independent to each other, which provides us in only a few cases with a specific therapy derived from the beautiful findings of MRI. The MRI has gained a fashionable status by some dentists and orthodontists in recent years and often used during routine treatments. The reason given is, that the operator must know exactly how it looks in the TMJ and any deviations eventually found would have to be “pre-treated” before orthodontic teratment could be started. Structural deviations from the ideal textbook examples are actually very common and can be found in MRI of the TMJ, but they are mostly meaningless, and neither lead to other therapies nor do they have any prognostic significance. The MRI of the TMJ is therefore usually a completely non-sense measure during diagnosis, which causes the patients to only be distressed by time effort and high costs. It is often prescribed against the state of scientific knowledge in order to simulate a special expert status and sell special therapies to elaborate to the patients due to harmless structural deviations. Justifying indications for an MRI include severe pain that persists for months and does not respond to normal treatment or the clarification prior to major elective surgery on the TMJ – both are present but extremely rare! If you or your child is prescribed an MRI despite there are no symptoms, you can deny this orthodontic treatment with a clear conscience! There neither is reason for an MRI even with a crackling TMJ because, in almost 100% of cases, the clicking sounds are caused by an anterior position of the disc in the TMJ. This is a harmless finding that does not require further diagnostics and/or treatment.